Portable and practical, tough and colorful, Bedouin textiles played a vital and functional part in the life of the Arab nomads. Produced on the simplest ground looms, the textiles were long-wearing and beautiful. The Bedouin women – the true craftspeople of the desert – wove to provide the very fabric of day-to-day living. 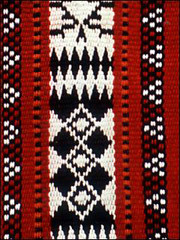 Joy will describe the weaving techniques of the Bedouin as they adapt from their ancient nomadic existence to a settled one. She will also talk about her research and travels in Saudi Arabia. Her work comes at a time when many tribal peoples are losing their cultural traditions. Joy Hilden is an acknowledged authority on Bedouin textiles. Her work is based on first-hand knowledge gleaned over a 12 year residence in Eastern Saudi Arabia and extensive travels throughout the Arabian Peninsula and the Middle East.